Resident Evil Revelations 2 is very telling of the times that Capcom has found itself in. Despite trying its darndest to be a AAA publisher similar to the likes of EA, Activision or dare I say Square Enix, it simply couldn't adjust to the atmosphere of the previous console generation and make those big budgeted games that appealed to the West. Its outsourcing experiments failed miserably, but the major culprit of this nearly disastrous period was Resident Evil 6. Capcom designed it with aspirations of showing the world how it could cater to everybody: older fans of the series, fans of the more modern action oriented spin on the franchise, Japanese gamers, Western gamers. And in doing so, it developed a game that appealed to nobody. Resident Evil 6 did alright on the grand scale of financial performances, but the damage to the series' credibility had been dealt. Too much money, not enough focus, no clear path for which was the franchise was heading. Capcom wisely heeded the advice of pretty much every person in the gaming industry. It slammed on the brakes rather than charging on blindly, and the last year has been dedicated to understanding the "back to the basics" mentality of what made it such a revolutionary series during its heyday. Luckily for Capcom, retro-gaming and nostalgia towards the PlayStation and PlayStation 2 days are at all all time high, and that's what Resident Evil thrived the most, so sales have allowed this era of experimentation. 2012's Resident Evil Revelations on the 3DS and its 2013 HD port to consoles were widely received as steps in the proper direction. 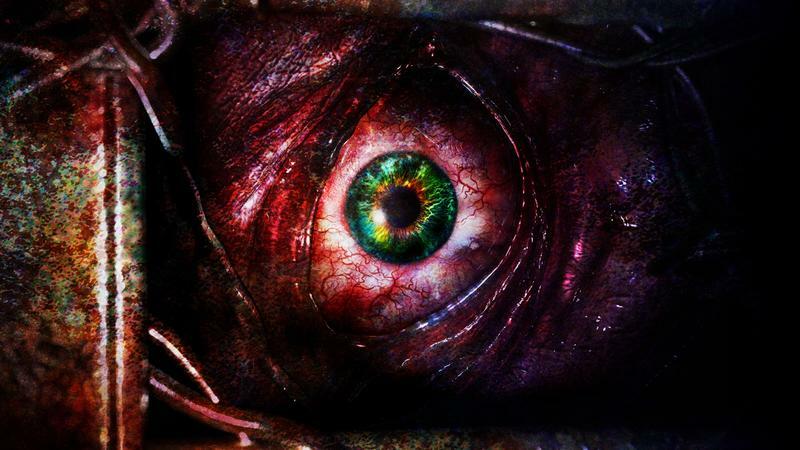 Now in 2015, we have already seen the excellent release of Resident Evil HD Remaster, and Capcom is hoping for a fourth consecutive solid release in Resident Evil Revelations 2. As you might have heard by now, Capcom has decided to split Resident Evil Revelations 2 up into four different episodes, similar in style to Telltale's staggered releases. The entire game will be released over the course of a whole month, and each will come with two chapters of story and content for the game's mini-game, Raid Mode. This review will cover the content available for the first episode, and then we'll come back in a month or so to wrap up the overall package. In Resident Evil Revelation 2's story, Capcom has provided us with two old friends to blast through this nightmarish zombie island with. Claire Redfield, star of Resident Evil 2, has returned to the series for the first time in over a decade, and it clearly shows. She is no longer the cool young biker girl sporting rebellious pink denim anymore. Her new getup in life is that of a middle aged soldier who battles the corporate face of all the world's bio-terrorism. This new big sister persona perfectly flows with her partner in crime, a new female delinquent named Moira Burton. These two find themselves prisoner on a zombie infested island with bracelets monitoring their movements and emotions. Moira's personality is harsher than Claire's was at her age, but she is too afraid to use a gun, for traumatic reasons not yet explained. Probably because her father is the fan-favorite gun nut Barry Burton from the first Resident Evil game. We just recently were granted the chance to get reacquainted with Barry in last month's remaster of Resident Evil, and its great to see he hasn't changed much over the years. Sure, he's much older, but he still holds that boyish confidence and blunt sense of humor which secured his legacy over the last 20 years. Capcom even landed voice actor Michael D. McConnohie of Crackdown fame to portray Barry this time around. It's the best casting choice the series has ever seen. And of course, he's a father now too, and he doesn't get along with his angsty teenage daughter. In his mission to rescue her from the stranded zombie island though, his daddy complex kicks in double fold with a new character named Natalia. You know, just because every horror story needs a creepy kid to trail around and humble the tough guy once in a while. Story mode tasks players with using two characters to complete its levels. One character, Claire or Barry, will act as a the combat specialist and take down the undead with heavy weaponry, and the other takes on a more utility role. In Moira's case, she shines a flashlight on objects and can pry open doors with a crowbar, and Natalia can sense zombies around turns and point them out to Barry. Again, creepy kids with their creepy powers. It may sound like a gimmick, but it's more engaging than you might guess. Naturally, most players will assume that taking the weapon oriented character as their main is the best option, and that the situational character will only be used in specific circumstances. However, the exact opposite proves to be the best method to progress. Controlling Resident Evil Revelations 2's utility characters allows for secret items to be uncovered and ambushes to be seen ahead of time. Combat proves to be more of a situational occurrence in this game. There is action, but isn't totally focused on it like Resident Evil 5 or 6 were. Fights erupt with common frequency and are totally scripted, but outside of these instances, there is little necessity to control the combat character. Capping the random zombie in a hallway happens surprisingly less often than you might expect. Blending these two portions of gameplay allows for a much more balanced overall package in terms of exploring dark corners, harvesting resources, and yes, still blasting away the undead. Don't be totally fooled though. It doesn't begin to touch the depth of Resident Evil 4. After two chapters have come to a close, I have yet to find any truly standout action set pieces or memorable levels. The game was obviously created with a small scope in mind, and level design takes a huge backseat towards the functioning gameplay and its inner mechanics. Resident Evil Revelations 2 is shallow to a point, but what it does, it does competently. Zombies leap through windows, and Claire or Barry shoot them in the face. Gears and keys open doors. Gems unlock new points for new powers. Ranks unlock cheats and secrets. The budget graphics create an atmospheric enough setting. Controls are tight and shooting is fun. And the story is shallow enough to skim through but also touching enough get somewhat emotionally involved in. The cliffhanger ending left me wanting a lot more. It all works fine, but it's nothing magnificent. This first episode alone is $5.99 after all, and you definitely get what you are paying for. Resident Evil Revelations 2 would be a rip-off at $59.99, but Capcom's payment plan creates the perfect illusion that "merely competency" is value at that price. How it all plays out into a $24.99 package has yet to be seen, but for $5.99, the first episode alone is worth checking out. Raid mode returns to this package as well. Resident Evil Revelations HD sported a solid campaign, but the main reason to return to the package over and over again came in the form of this added bonus mini-game. If you've never experienced that before, imagine it to be an RPG evolution of Resident Evil 4 and 5's Mercenaries Mode. If you've never experienced that, imagine it to be a brief, action packed burst of Resident Evil's unique brand of shooting. Drop the $5.99, and find out for yourself. Raid Mode in Resident Evil Revelations 2 makes several improvements over its predecessors, but it remains relatively intact. You'll still dive into a segmented map, shoot up zombies, unlock guns and upgrades, and gain experience points for skills and passive abilities. Local co-op is still an option, but Raid Mode is limited to local multiplayer until Capcom releases the final physical product. In the meantime, unless you have some friends wanting to play who live nearby, you'll be blasting through these repetitive missions alone. Luckily, Raid Mode has that extra lure of improving your favorite Resident Evil characters with the built in RPG system. It's enough for fun bursts, but I wouldn't expect to get in a solo round or two at a time before its appeal start to waver. Again, enough content has been jammed into this $5.99 episode to give players an appetizer into buying more, but if Raid Mode is the main allure of this package for you, then it might be best to wait for the final product. That goes on the whole for all of Resident Evil Revelations 2. So far, it's a solid little action game for $5.99, and it teases just enough story, gameplay, and RPG content to lure gamers into buying another chapter or the whole package outright. There is enjoyment to be found here, but those looking for it should be prepared to enter with expectations. This is clearly Resident Evil created on a budget. Graphics are serviceable, atmosphere gets by, action segments grant slight chills, but never the shrilling tension of the true masters of the genre. At the same time, that classic feel still remains. Zombies lurk around the corner. Classic heroes Barry and Claire show up. Bullets must be saved, and every one has to count. Resident Evil Revelations 2 has that little extra "something" which separates the franchise from the rest of the third-person shooters out there. Like its predecessor, Resident Evil Revelations 2 is not going to shift the world, but it should do just enough to convince fans that some people at Capcom still get what makes the series special. My guess is Capcom is prepping to make this team the new studs of the company, and I can't wait to see what they can do with a bigger budget. Expect them to be in charge if Resident Evil 7 ever becomes a reality. As for Resident Evil Revelations 2, I'll give it two ratings. It's a definite "buy" if you enjoyed the first Revelations game and want to get a grasp on the new raid mode before the online community takes off. The story also revolves around creating suspension week by week, and it has me involved enough to want to stay tuned next week. Replay comes from unlocking cheats, using them to create different scenarios, trying new guns, finding secrets, conquering challenges, speed-running, the infinite possibilities of Raid Mode, and of course, shooting an army of scripted zombies in the face. At the same time, it might also be best to "wait" for Revelations 2 to wrap itself up and buy as a full package. This is a huge experiment for Capcom, something the company has never done before, so there is no knowing if it will pan out as it originally envisioned. $5.99 is not that big of a risk, but the $24.99 might be for some people. Disclaimer: We purchased Resident Evil Revelations 2 for the PlayStation 4 with company funds and played through both available chapters and several missions of Raid Mode before writing this review.